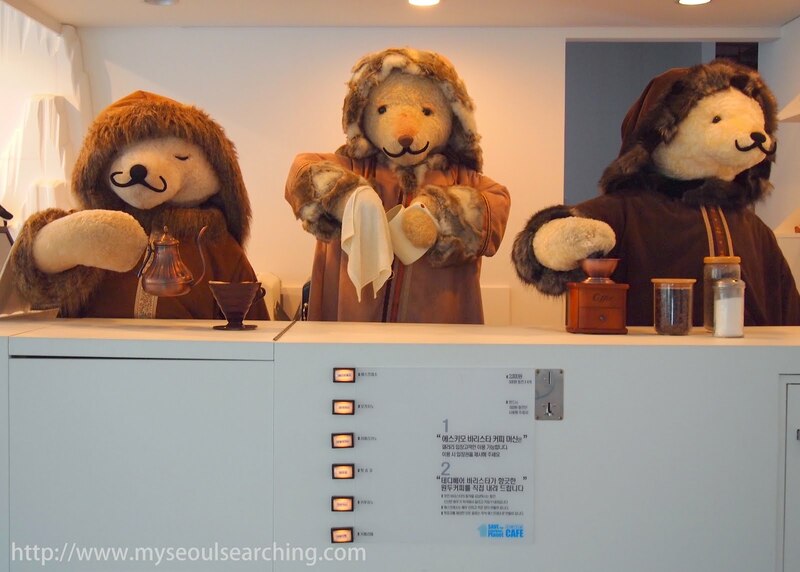 As promised, I've continued the search for Seoul's best themed cafes. I am happy to report that my most recent finds include a diverse mix of polar bears, bananas, puppies, and cupcakes that will make you scream... with delight. So, without further ado, I give you Coffee with Character, Part Three. Tucked away on an obscure street in upscale Sinsa-dong is Banana Tree, a charming cafe inspired by, well, bananas. Instead of 'going bananas' with the theme, Banana Tree uses hues of yellow and banana decor- a door prop here, an ornament there- in a subtle fashion to incorporate the concept. Perhaps the highlight of the cafe's theme is the banana pudding that they serve in small flowerpots, complete with silk flower embellishments. Inspired by the pudding at New York's Magnolia Bakery, the dessert is not only cute, it's incredibly delicious without being too sweet. The cafe is small, with only a few tables, but there's a lot of light and the covered patio seating is an ideal place to chat or read a book. 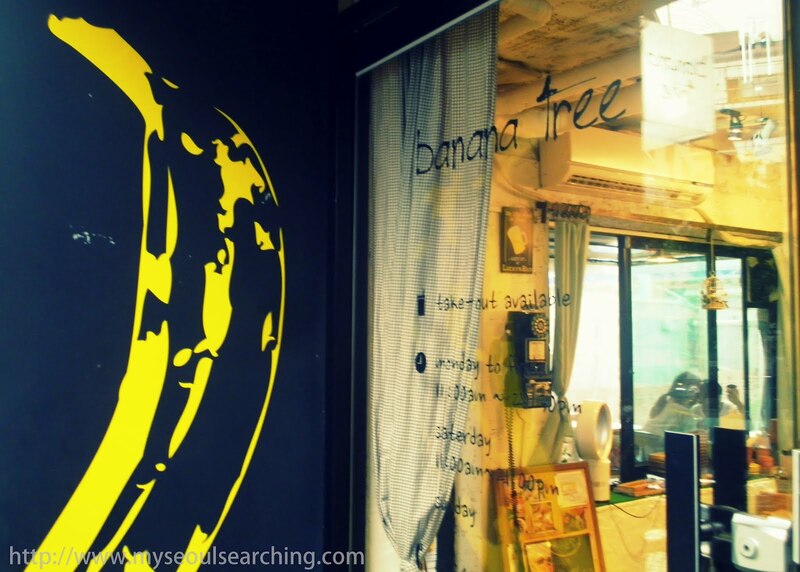 An Andy Warhol like banana on the facade of the cafe makes it hard to miss the Banana Tree. Bits of banana motif give the cafe just the right amount of theme. Banana pudding served in a flower pot and topped with crushed Oreos is the main draw of the Banana Tree. Save the Planet Polar Bear Cafe is one of the many adorable sights to be seen in Heyri, Paju, just outside of Seoul. I was lucky to find this themed cafe by chance when wandering The Step (Dalki) building this past weekend. The cafe is part of the Teddy Bear Art Gallery, an adorable museum of stuffed toy bears. Though there is an admission to get into the museum, the cafe has a separate entrance and does not require a ticket. The interior of the cafe resembles the Arctic: sleek white plastic chairs and tables are surrounded by ice caps on the walls and penguins welcome guests by the counter. There are two coffee menus, both of which are limited to the basics. The first costs a bit more and beverages are prepared by human attendants. The second, and less obvious menu, is posted in front of the furrier baristas. Three life-size polar bears, dressed in coats, and focused on their jobs, dance every few minutes and magically "serve" coffee via a vending machine. It's a cute place to see when in Heyri and is especially a hit with kids. 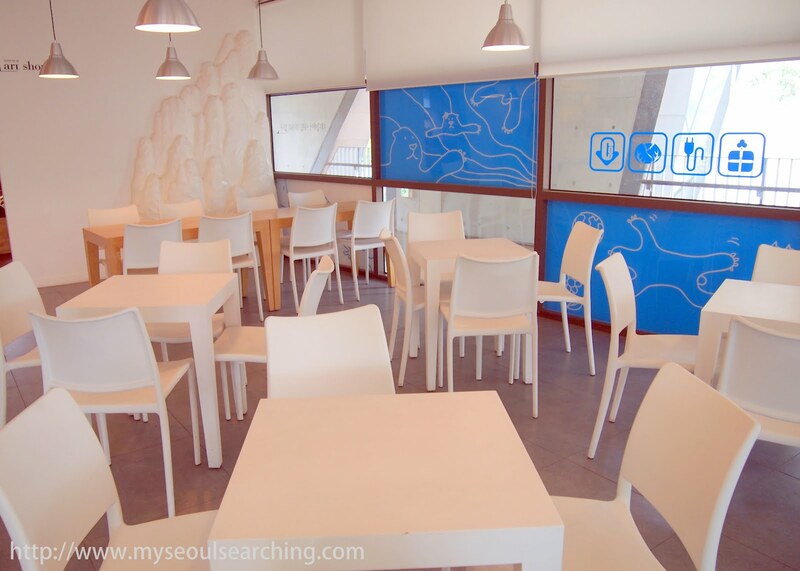 Sleek white tables and chairs create an Arctic vibe in the cafe. I'm pretty sure penguins and polar bears live on opposite poles, but they seem to get along pretty well here. Are these not the cutest baristas you've ever seen? What do Cookie Monster, Chucky, and the gremlins all have in common? 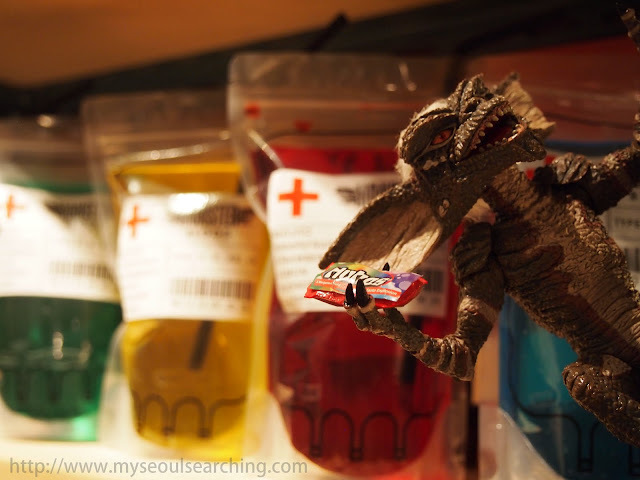 They're all hanging out in Noksapyeong at Monster Cupcakes, the creepiest bakery to hit Seoul. Inspired by classic horror movies, the monster motif at this cafe makes it feel as if Halloween is everyday. I couldn't help but be impressed by the artistry of the cupcakes. I marveled at all the details added, like the sharpened knive blades and the wrinkles on the Frankenstein feet. The chefs no doubt have a lot of passion for the craft and take a lot of pride in their work. 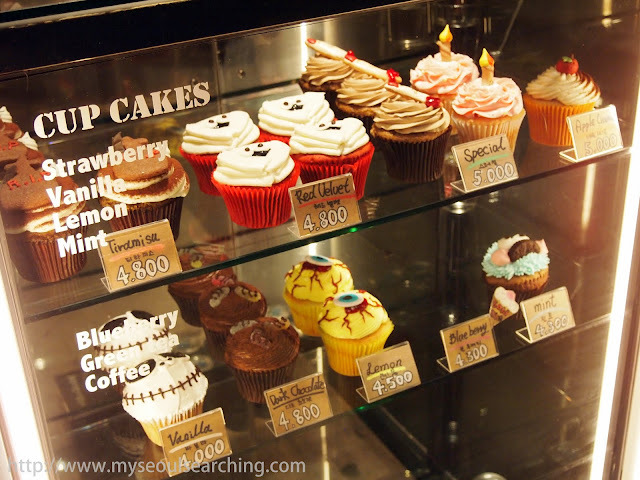 It's nearly impossible to find a good cupcake in Seoul, which is why Monster Cupcakes is an incredible find. Flavor options are limited but the cake is moist and perfectly sweet. I was craving red velvet but the tiramasu was far too cute to pass up, so I opted for the latter. The vanilla cake was topped with a light cream and rich chocolate and coffee flavors. There was a cookie in the shape of a tombstone that was just as tasty. A bat and ghost were also added to complete the edible art. 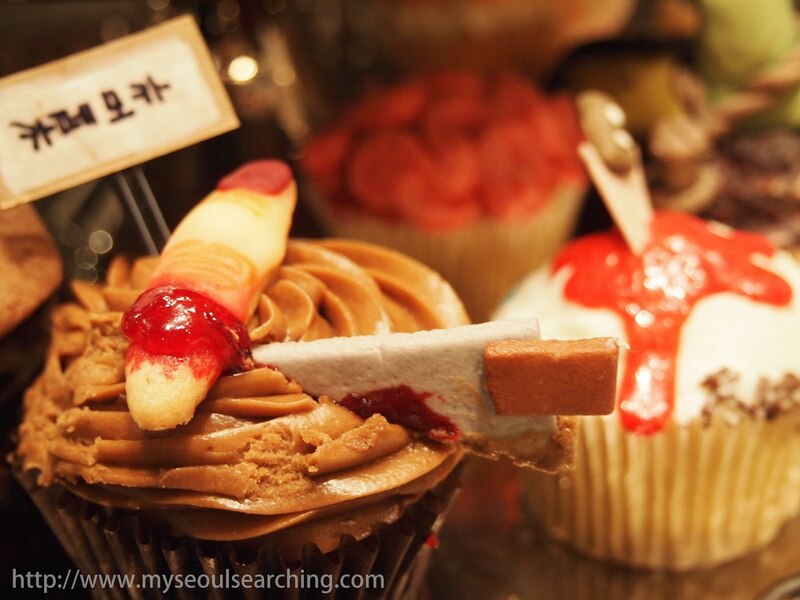 A cupcake will set you back 4,000-5,000 won which seems pricey but is well worth it for both the novelty and taste. Hand drip coffee is also for sale, but there are only a few seats in the small cafe. For take-out, Monster Cupcakes will carefully package your cupcake so that its design doesn't get ruined. 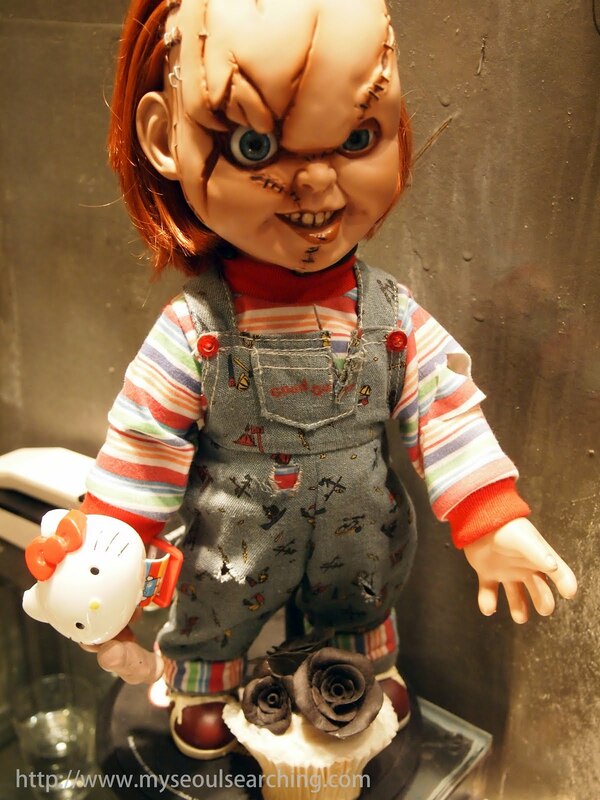 Chucky loves Monster Cupcake's hand drip coffee... and his Hello Kitty bracelet. Monster Cupcakes will have you screaming... with delight! The gremlins may not have responded well to water, but they apparently love cupcakes. Brains, fingers, and blood... oh my! I've considered buying a dog on more than one occasion in Korea, only to soon thereafter look at my shoebox of a room and decide that it wouldn't be fair for the dog. 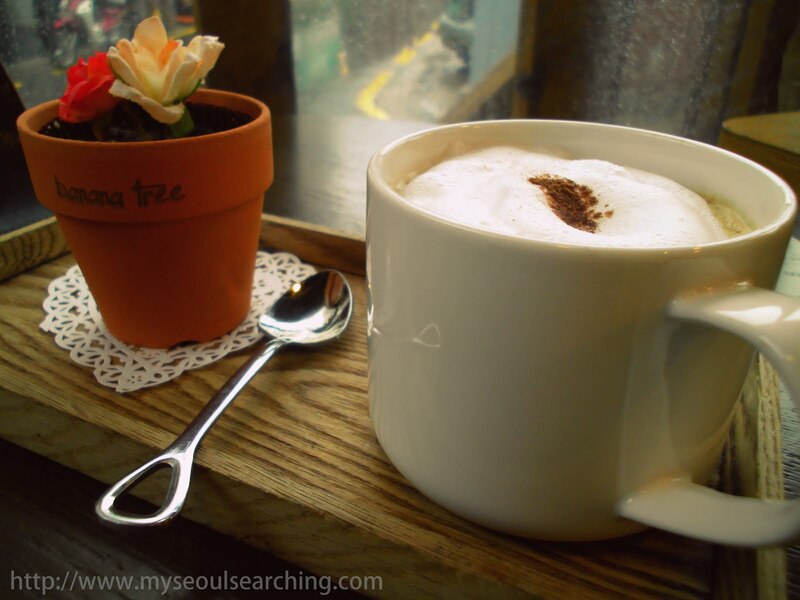 Luckily for me, there are cafes in Seoul to pacify puppy fever and after talking about going for at a least a year, I finally got around to visiting Bau House Cafe. I could hear Bau House before I could see it. Upon entering the cafe's new location close to Hapjeong Station, I was immediately overwhelmed by cuteness and dog odor. Fortunately, the smell became unnoticeable after sitting down and relishing in my first experience at a pet cafe. 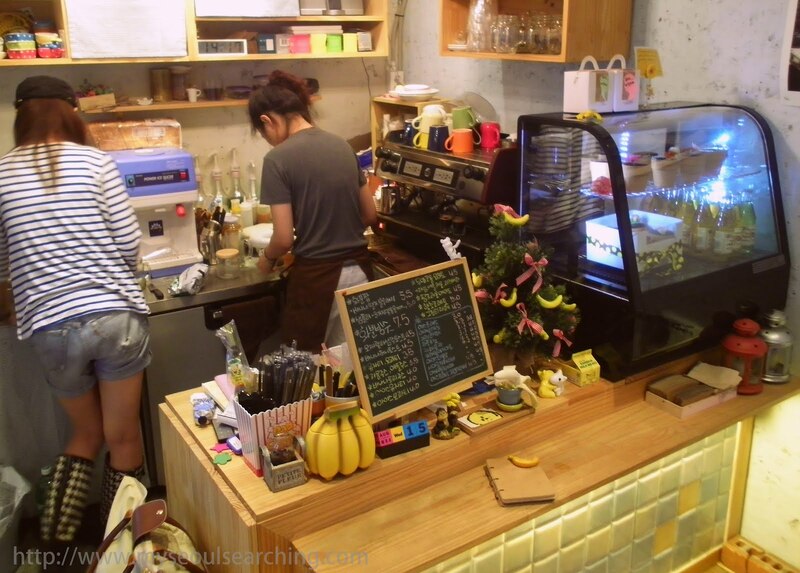 These cafes have become quite popular in northern Asia, and the Hongdae area is full of them. 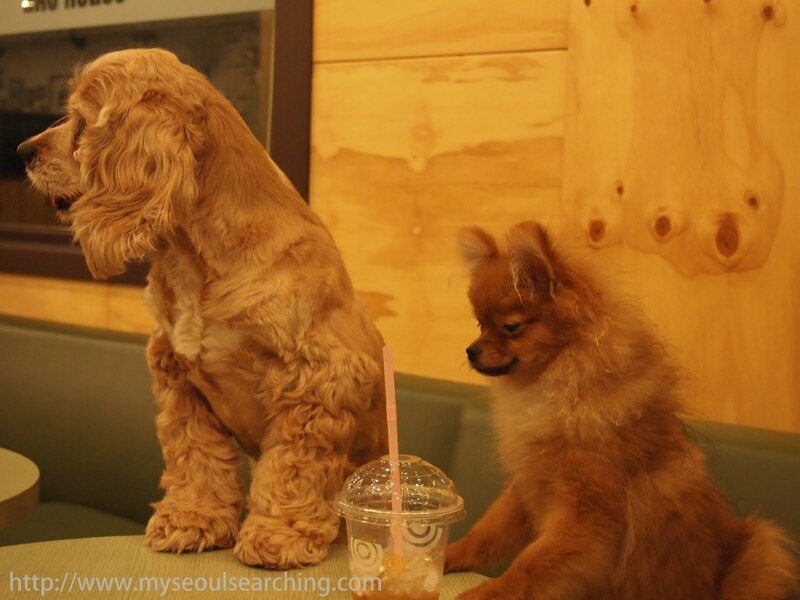 Bau House Cafe requires that visitors purchase a drink (5,000-10,000 won) to take a seat and play with the pups. I can't even comment on the coffee, because, let's face it: the canines are the attraction. 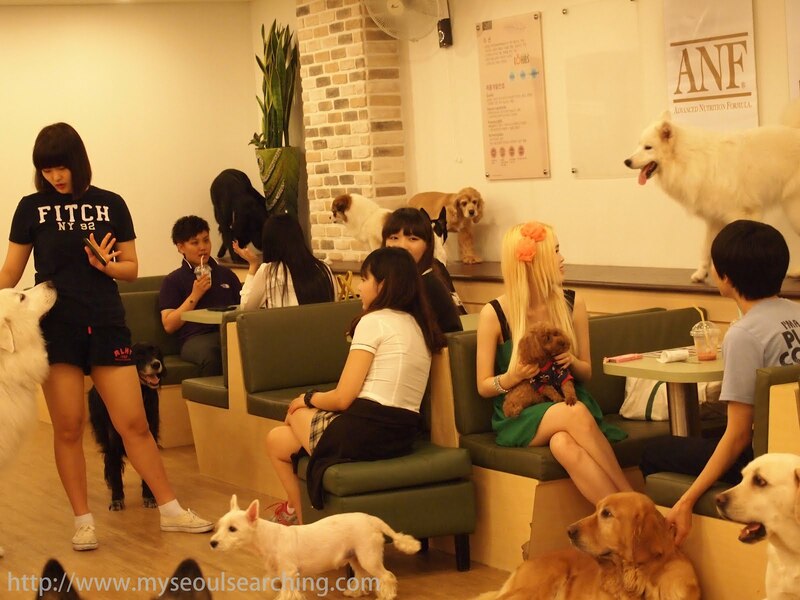 The cafe is divided into two parts: small dogs and large dogs. There are about 20 resident dogs to play with and visitors are given a copy of their pictures, names, ages, and breeds. The cafe also functions as a dog hotel, so there are always a few extra pups to keep you company while sipping on your coffee. The cafe was actually very clean and attendants were quick to clean up accidents or slobber. The dogs were all extremely friendly and cuddly. The small dogs were eager to climb up into visitors' laps and the big dogs pawed and played with those enjoying their drinks. It was made obvious that these canines enjoy their lives at Bau House. 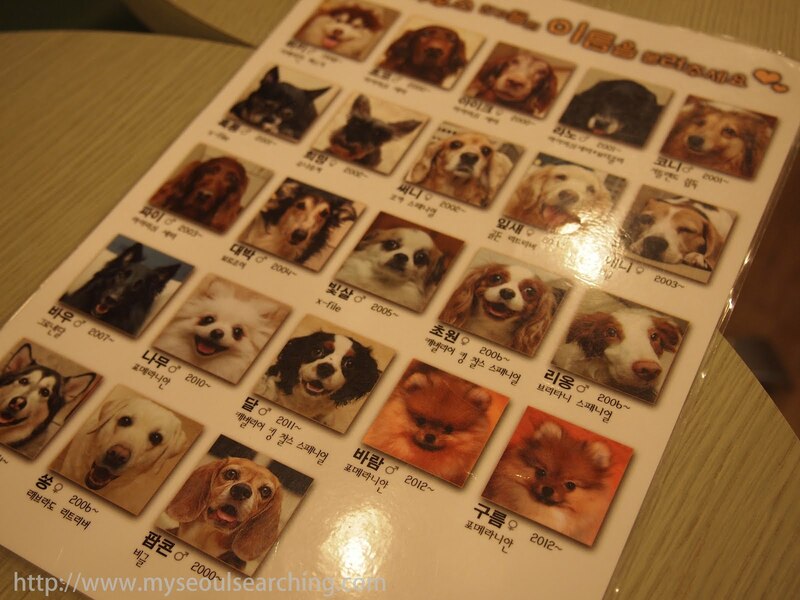 In addition to menus, visitors to Bau House are also given a list of the dogs names, ages, and breeds. Who wouldn't love one of these furry coffee companions? Stay tuned for even more themed cafes. Until then, check out previous Coffee With Character posts. Read part one here and part two here. The dog one looks AMAZING. I've also considered buying a dog here but decided against it for a similar reason...plus there isn't anywhere to walk them in Saigon.